Thank you, Ann. It’s an honor to be here with you all this morning; thank you for that warm welcome. What a wave of positive energy to start the day…wow! Do you know where those comments come from? I bet Dr. Tyson does! I think that’s about the best report card I’ve ever read! Give yourselves a round of applause. Well done! You understand what President Obama said recently about “setting your own goals” and “fulfilling your responsibility for your education”. You already place a high value on school, and that’s something we have in common. Because, let me tell you: without an education, I wouldn’t be standing in front of you this morning. I didn’t exactly plan on becoming a Queen! I didn’t take a Regents in Royalty Preparation! Then fate intervened and I met my Prince. And that’s no metaphor: he really was a Prince! So, suddenly, I had a job I never imagined I’d have. And it is a job…one which has given me the chance to work hard on the issues I care about most: lifting the lives of Jordanians…running an NGO that strengthens communities…helping to revamp our country’s public school system. It’s given me the chance to discuss development issues with President Clinton…launch international campaigns with the British Prime Minister…meet people like Bill Gates and Oprah Winfrey… and, most importantly, meet girls like you. Throughout all of this, my education’s been my compass…my springboard…my shield. Good, better, best, you should never rest…’til your good is better, and your better, best. Well, I never rested. I’m still learning…still striving to be the best I can be. Just like I know you are too. But I also know that we’re the lucky ones. Because kids from East Harlem face social and economic hardships that no young person should have to endure…and often don’t do as well in school as they should. Maybe they skip class, drop out early, don’t get good jobs. Maybe they turn to substance abuse or petty crime, or have kids when they’re still kids themselves. Maybe you know stories like this? But that’s not your story. Your story’s different… because of the vision of one woman, and the commitment of many. She’s a woman who understands the power of education…a woman who saw potential and promise in the girls of East Harlem…a woman who believed that your zip code shouldn’t determine your fate in life. That woman is Ann Tisch. You’re here because she set about creating what I call a ‘reverse domino effect’…and that’s where one woman lifts another woman up, and passes her gift of strength on. One by one, women stand tall and strong. And let me say that this morning, I’m looking out at a sea of tall and strong young women…and the tide is unstoppable, girls! You are women who’ll work hard to get into college, who’ll make your families proud, and who’ll be role models for your children, communities and country. …And you’ll show Ann Tisch that she was right to fight for you. But around the world, there are millions of girls who are not so lucky. From sub-Saharan Africa…to South East Asia…and beyond, 41 million girls are out of school - that’s double the population of New York! They’re out fetching water… out working in fields and factories… out marrying early. Many of them stand outside school gates, peering in, wondering what it would be like to go to school. But poverty, prejudice, and place of birth weigh them down… and they cannot get in. Ironically, once they’re in classrooms, girls often perform better than boys; they leave school smarter and with more self-respect; and go on to live healthier lives, enjoy better jobs, and raise children that learn more and live longer. But their journey to justice, equality, and a second chance is never easy. Let me tell you about Devli, a little girl, I had the honor of meeting last year. Devli was born as a slave into a stone quarry in India; she carried heavy, sharp, dusty stones for 20 hours a day, often on little food or sleep. She was beaten if she took a rest. And yet, incredibly, Devli’s pleas, and those of other girls like her, are not moving our politicians to action. And that’s not fair! 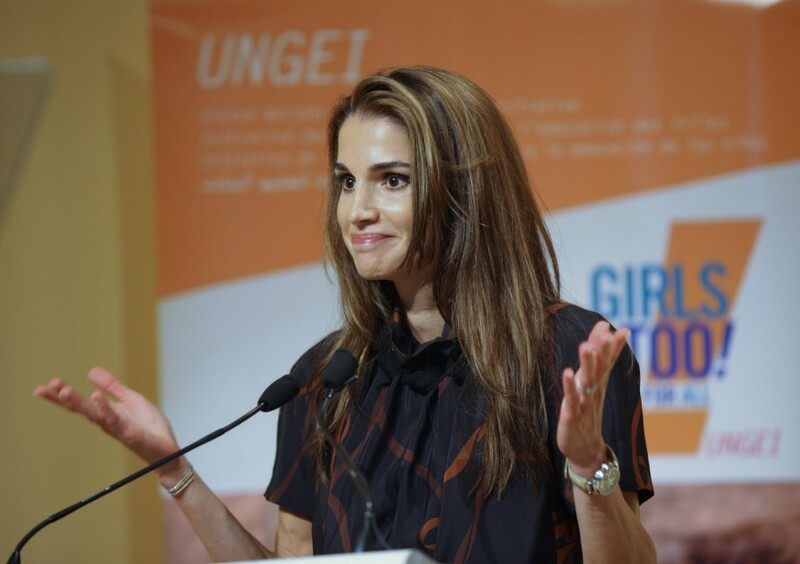 That’s why I’m proud to work with UNICEF, and be the Honorary Chairperson of the United Nations Girls Education Initiative. The Girls Education Initiative works around the world to get girls into schools: advising governments, working with policymakers, mobilizing donations, and speaking out on behalf of girls in the halls of power. But we can’t do it alone. We need a chorus of voices to rise up and wake up our leaders. Write to President Obama and Hillary Clinton; ask them to place girls at the top of their global agenda. Volunteer to build a school with Free the Children.com. And when you leave school today, I want you to remember the girls of the developing world. I want you, girls with voices, to speak up and shout out for girls whose cries fall silent. I want you to fight for them, as others are fighting for you. I want you to pull up another girl, and help her stand tall and strong. I want you to be great, and inspire greatness in others.